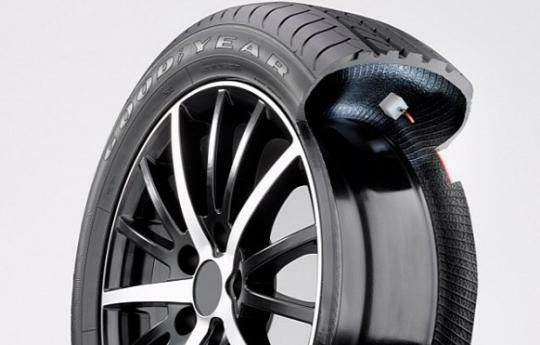 Goodyear has chosen the 2012 Internationale Automobil-Ausstellung (IAA) Commercial Vehicle Show to showcase their innovative self-inflating tire technology known as the Air Maintenance Technology (AMT). The system has been undergoing testing over the past few years. The tire is fitted with a peristaltic pump which consists of a tube with valves running along the bead. 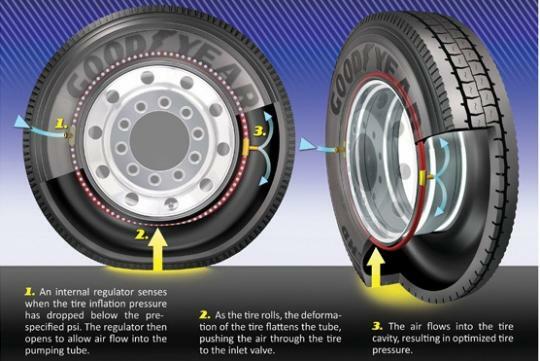 When the tire pressure drops, the valves open and the squeezing effect caused by the deformation of the tire rubber pumps air from the atmosphere into the chamber until the right pressure is achieved. Conversely, when the tire pressure is too high, the system can lower the pressure to the correct level. The beauty of the system is that no electronics are involved. "While the technology is complex, the idea behind the AMT system is relatively simple and powered by the tire itself as it rolls down the road," said Jean-Claude Kihn, Goodyear senior vice president and chief technical officer. If you think that replacement of punctured tire will become a thing of the past, think again. When the car comes to a halt, the system will cease to function as the rolling action is non-existent. This means that the punctured tire needs to be replaced before driving off unless the driver wants to put his alloy rim at risk. Goodyear has received grants from the United States Department of Energy's Office of Vehicle Technology to aid further development. Keeping tires at the optimal operating pressure can lower emissions, prolong tire lifespan, and enhance safety and vehicle performance. If the system proves itself in commercial vehicles, it may be adopted for regular road car use within a few years. Even though if the car comes to a halt , the amount of air flows into the tire cavity has already sufficiently optimized the tire pressure. Personally feel is a very good innovative for safety reason.